There’s a pretty well defined linear fantasy harboured by senior high-school students and uni folks early in their undergrad. You know the one: graduate ‘on time’ (if not early! ), immediately get a great grad job at 21, buy a great house by 25 without ever having to pay a cent of rent (yay, parents). No twists, no turns, no hassles! The reality isn’t so smooth. Things happen, and sometimes, any small deviation from that linear fantasy gets seen as ‘falling behind’ or as some sort of minor failure. It’s unfortunate, because those type of goals aren’t going to suit everyone. Whichever way you want to tackle uni and your early twenties, there’s merit to it, even though it’s not often talked about. So – here it is. Five benefits to doing uni part-time! No disrespect to the late Biggie Smalls, but I can only assume he wasn’t studying on a student budget when he wrote “Mo Money Mo Problems”. In fact, according to the recently released results of the 2017 Universities Australia Student Finances Survey, up to 60% of domestic students are stressing on their finances. That same survey suggests the vast majority of full-time students work while they study, and puts the median income of full-time undergrads at $18,300. It stands to reason that if you halve your units, you could double your income – or more. As you increase your hours, you’re a greater chance of increasing your hourly income as more job opportunities with a high amount of minimum hours become open to you. It’s not all sunshine and rainbows – there’s obviously a trade off, with part-time students more likely to report to missing classes due to work, though many would be forced into their routine by circumstance. Opting in voluntarily could prove lucrative for the savvy student. The more you earn early, the sooner you can enter the stock market, make voluntary super contributions, or even save for an eventual house deposit. Doing uni part-time gives you the opportunity to let compound interest work its dark magic sooner and come out financially on top in the long-term. As great as getting filthy rich can be, the whole point of earning money is so that it can help us be happy and flourish. It sounds crazy, but taking in a bigger income would allow you to travel literally every year, if you wanted to. You could go to Tokyo one year, Paris the next. Or, you could see one of the most beautiful countries in the world – your own! Almost all the uni students I know won’t hesitate to tell you how much they would love to travel to all these amazing places, but few of them do! It sounds insane to say, and it’s a huge choice to make, but it’s genuinely possible to do uni part-time, work more, and travel annually. It’s a nice thought, isn’t it? Well, that thought is an option! It might sound paradoxical, but doing uni part-time might actually be a fast-track to the kind of career you’re looking for. You’ve seen the memes about entry level jobs requiring three years work experience. Well – here’s a way to get that type of experience (and more). Under a full-time load, most students flock to retail or food service because of the flexibility and the acceptability of working fewer hours. Many professional jobs on offer will have part-time work listed at a minimum of 25 hours a week, which after commuting beyond what’s local proves too much for a full-time undergrad. One benefit of part-time is the option to start building an impressive resume early. Your increased availability will hopefully bring you greater opportunity to work in your preferred industries, and the more industry knowledge you gain, the further you can go before you actually even have your qualification. Whilst your peers might judge you for not graduating “on time”, when your employer sees the experience you have and the skills you’ve built yourself, they won’t waste their time giving half a thought to the pace you set gaining your piece of paper. Obviously, finances won’t be as much of an issue, but depending on how much you work, you’re still going to be running a pretty busy calendar. You’re still going to have competing priorities – but as your uni obligations are reduced, even as work picks up, they could be much easier to manage. For example, let’s say you’re working 15 hours a week and taking four units. One fortnight in the semester, you might end up with four midsems, or four essays to write, in addition to your hours of work, and heading into the exam period, you have four exams to revise for in a very limited amount of time. If you doubled the hours of work and halved the units… well, it’s not exactly a carefree scenario, but it may be easier to manage. Whilst you’re working 30 hours a week, now you’ve just got two essays for the fortnight – an easy split of one per week. Admittedly, it’s super subjective, but you have less “things” to think about. Four units and work make five things. Two units and work make three things – with a lot more hours dedicated to work, obviously. Even as you up your hours, you reduce your competing priorities. For some, in conjunction to not having financial worries, that might just be the necessary formula to reduce your overall levels of stress and boost your results. When you’re at uni full-time, just about everything falls by the wayside. It can be similar as you move into your first grad job without taking a break – the stress never dissipates and you can get stuck in the idea of just ‘doing what needs to be done’ without looking too far ahead. Slowing down your undergrad gives the savvy student an opportunity to make some moves on the future. Ironically, the linear fantasy of “graduate ASAP, work ASAP, buy a house ASAP” can be the type of thinking that precludes one from entering the housing market early – you haven’t built up the funds. Once you graduate, the pressure to ‘have things under control’ starts to build, but you can totally delay the experience of this issue by delaying your graduation! I jest, but there could be something there. 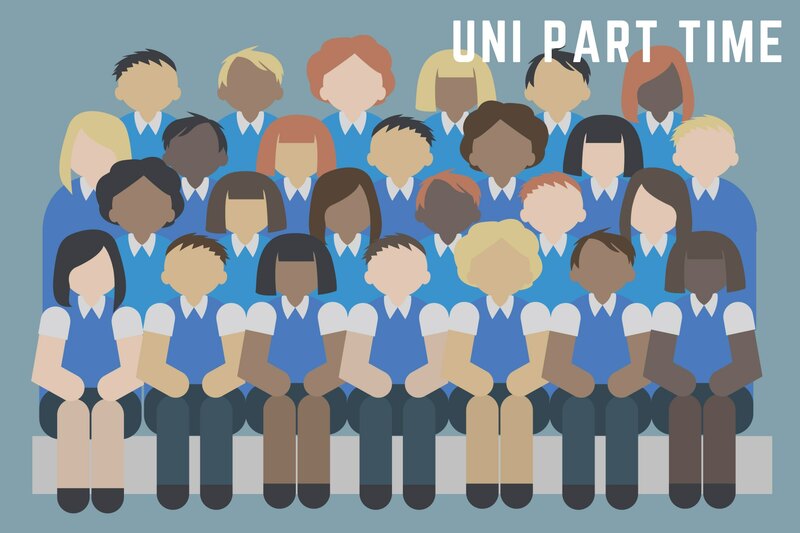 With a year or two (or more) tacked onto your degree, and with tens of thousands of dollars more in the bank account, taking uni part-time could give you the opportunity to grow and make decisions about your future. More than that, though, it gives you the time to implement the decisions you make and be highly deliberate with what you choose to do with your time and your money throughout your undergrad degree. Part-time isn’t for everyone, and shouldn’t be recommended to everyone, either. Part-time is for someone, though, and chances are that the people taking uni part-time are doing it for good reason – there are some great benefits to it! There’s nothing wrong with deviating from what’s presented as the ‘traditional’ path – what this article refers to as the linear fantasy. At the end of the day, getting off that path might just find you in Europe!